I was thinking,I see very few sawmills being towed down the road. In fact I really can not remember the last time I saw one and where it was.We go alot too. Not too many freeways,but mostly back roads and state highways. I see every piece of heavy equipment being hauled,right from tractors to forwarders. I don't miss a log truck,empty or full either. Re: Do see sawmills being towed on the road? I see one occasionally and wonder, "what the heck is he doing in my territory?" I've never seen another portable mill on the road. I do see loaded log trucks at least 1 or 2 times a month, and this is not a big timber area. I see log trucks every day, only seen one other portable sawmill on the road. In my neck of the woods commercial circle mills are king. Delawhere Jack,that could be another whole thread,how often you see a loaded log truck? I never gave that much of a thought. I see at least one in a 20 minute drive. very common to meet one empty or full. Helps to live only 20 minutes from a paper mill. But I see logs too. But I see logs too. I see logs too. Most of them are along the road when I'm driving and are still standing with limbs on them. I have never thought of it, but I can't say that I've ever seen a portable mill being towed either. Funny thing is, Timberking's factory is less than 5 miles from where the fire station is I work at. It's about 20 miles from my house and my wood yard is right along the interstate so I would think that would improve my chances of a sighting. Maybe they are kind of like a sasquatch. Very elusive. When we had a wind storm last year and they were doing salvage logging I thing we had 1/2 the trucks from the central Nth Island rolling though town. On a 1/2 hour drive back from town I counted 15 one day. There would have been 15 empty ones following me too. Today I counted 3 in a 15 minute walk down our main street, that's a more normal number. Portable mills? Woodmizer type mills are rare as hens teeth, you occasionally see some other mill on the road, but a swingmill on the back of truck doesn't really stand out. I've seen 3 in the last 11 years, they have all been LT 40's. I saw one (orange) loaded in the back of a pickup, hanging out a little, a month or two back. One or two a year. There used to be a lot of mobile sawyers in these parts but most of them have retired or found something else to do. Most of the time when I see one, I can figure out who it belongs to. We are out there, I swear we are. It is an unusual sight though. I frequently get people who drive along side on the interstate or try to flag me down. I have my web address on both sides of the mill and on my truck. I've even had them follow me to the client's home. If I pull through a parking lot, or into a gas station, I'll usually end up handing out several business cards. Some will ask, "is that a sawmill?" when there are magnetic signs on the door of my truck that "Tom The Sawyer Portable Sawmill Service"... (here's your sign). There are a lot of people (even woodworkers) who had no idea such a machine existed and are very curious. I am looking into pulling it as an entry in our local community parade next summer. You've never driven down my street, I probably would have noticed. 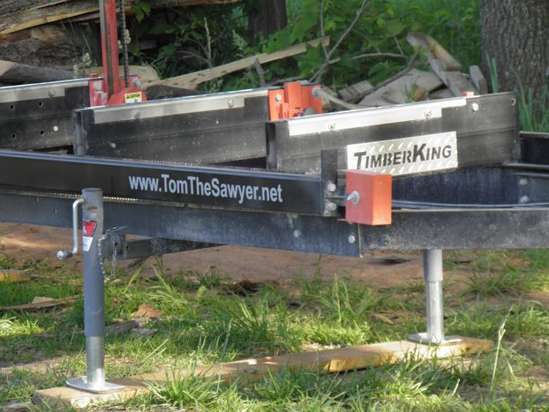 More than 10 years ago I saw a mill set up sawing as I was driving I85. I know of 5 or 6 sawyers within 10 miles of me but I have never seen one on the road. I expect to draw a lot of attention as I pull my mill but I never do. To the general public we are just another machine on the road. Don't they know how important portable mills are? . I'm afraid we are the only ones who will notice. Oops - there is one recent exception: a guy approached me as I was setting up in an urban setting and wanted my contact info. Felt great. Most portable bandmills are used stationary,only a handfull of roadies.Its worth having an axle under them just for shipping from the factory,just imagine a LT-70 delivered as a kit to wire and assemble. [not picking on WM] Frank C.
I've only seen one. It was heading north, I was heading south. I would guess an older LT40. The sun wasn't up yet so not for sure. I see plenty of log trucks though. I too get a lot of stares rolling through town, or passer bys on the interstate. I've never seen one going down the road, but when I brought mine home in the back of the truck it was dark out and yet plenty of people in town know all about it. As far as logs, I live at the edge of The Allegheney Natl Forest, and State Game Lands no. 24. I see at least 5-6 loads go by my house every day, and when you go into town you can't hekp but see at least 2-3 loads. I've never seen one being pulled down the road and I do a lot of driving. My monthly commute to shorebase is 430 miles. Page created in 0.824 seconds with 40 queries.